At little art we offer mindful art experiences for companies that care about their teams. For groups that want to find new ways to collaborate and grow together, inspiring participants to break through their personal, social and creative blocks. We disconnect from digital devices and reconnect with our making hands, to tinker and discover unique forms of self-expression. We challenge established working patterns through deliberate provocations, to generate open ended possibilities and cultivate out of the box creative thinking. We work closely with you to create the right space for your team’s sense of curiosity & wonder to come out and play through our Creativity LABs. We use art, sensory and creative processes to help you slow down, notice and learn more intimately about the unique ways you and your colleagues approach tasks and solve problems. A way to get into a state of flow, to notice and challenge learned behaviours and takeaway ideas you experienced to calm everyday anxieties. We help you and your team courageously build creative confidence together, shifting perspectives on in-built social and operational boundaries. You will discover new ways of tackling challenges and find unexpected ways to collaborate and co-create. Letting go of the pressure to perform, taking risks to inspire. Designers and creatives looking to explore new ways to solve problems and create, to spark joy in the process of slower analogue designing, reconnect with real life image making and observation. Change Makers and Project teams looking to explore new ways to transform and innovate, generate new methods of collaboration and co-creation. The Curious looking to let go of everyday stress, reconnect with their creative side and get into a state of relaxed flow. YouTube, Set Live, Gimmemore, Fjord Design and Innovation Agency Berlin, SnapShot Hotel Analytics, Expath, Sankt Oberholz, Culture Fox, Little popup, Rabbel Magazine, Travelogue, We Work, Entretempo Kitchen Gallery, Jake and Maya Kids, Juggle Hub Coworking, ESMT Business School, Greta und Björn, Yin Yoga Berlin, Easy Busy Coworking Space. Play with the forgotten art of analogue photographic image-making. Spark joy in the process of slow creation and observation. Let go of the urge to be perfect and feel new creative impulses emerge. Take a moment to enjoy the flow through the printmaking process. Get away from digital graphics and nurture your natural curiosity by exploring the surprising combinations of unexpected materials and layered techniques. Let go of everyday stress and replenish your energy by diving into a mindful fluid paint process. Turn-off the pressure of outcome and learn to embrace the serendipity of the imperfect. Unleash the creative team spirit and help them reconnect with their inner child in this quirky and fun exploration of the unknown. Build something unexpected alone or in teams. You will be amazed at all the creative solutions you can come up with. Interested in organising something completely bespoke and created uniquely for your team? A time out session during your conference or event or a Creative Breakfast workshop? 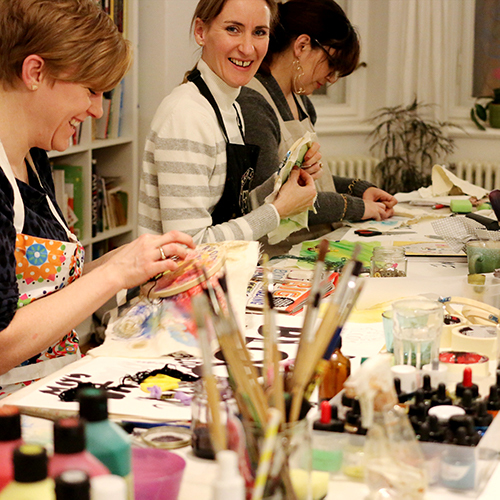 We also offer an 8-12 week creativity mentoring programme, to help your team prevent burnout and increase overall mental wellbeing, feeding a creative habit.